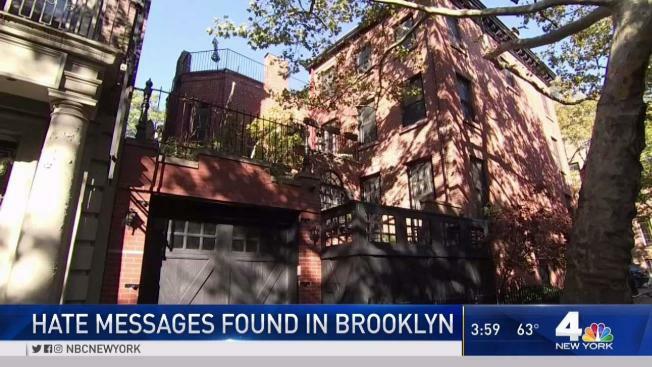 A quiet block in Brooklyn Heights famed for its popularity with trick-or-treaters was defaced with Nazi symbols and other slurs the night before Halloween. John Chandler reports. A quiet block in Brooklyn Heights famed for its popularity with trick-or-treaters was defaced with Nazi symbols and other slurs the night before Halloween. Photos obtained by News 4 shows crudely drawn images all over a Garden Place garage door, and NYPD officers swarming the neighborhood well into the evening. Police sources said Wednesday they found swastikas and the n-word chalked in multiple locations up and down the street. It is being investigated as a hate crime. The NYPD is asking anyone who may have video or surveillance of the incident to come forward. Garden Place is renowned in the community for its Halloween celebrations. The Mommy Poppins blog described its decorations as "over the top" and called it the "epicenter" of the holiday in the community. The incident comes just three days after the deadliest attack against a Jewish community in American history, the massacre of 11 people at a synagogue in Pittsburgh. The local branch of the Anti-Defamation League says anti-Semitic incidents in New York rose 90 percent in 2017 over 2016.